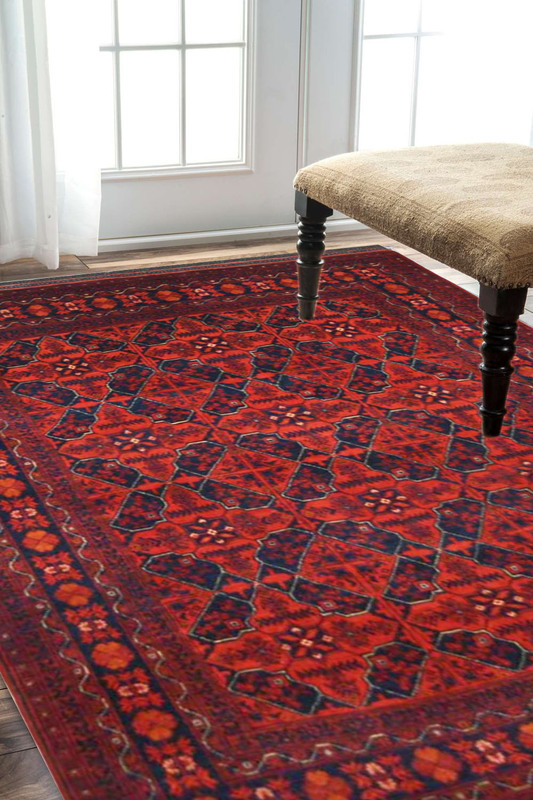 Bright red caucasian design 100% handmade afghan rug. This stunning piece is from our Khan Mohammdi collection. Hints of burnt orange on the border with tinges of royal blue are also dominant in this rug. - Gorgeous Baluch rug from our Khan Mohammadi collection. - The design has been originated from the Baluch region of North-Western Afghanistan. - A mix of dark red and maroon with an intricate border indicates skilled craftsmanship. - Suitable for Living room with subtle interiors. - Herbal washed and is in perfect condition. - Will be shipped within 48 hours of order placed.